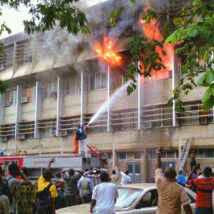 The Madam Tinubu hall of University of Lagos (UNILAG), Yaba, Lagos state, reportedly has been caught on fire today, October 12. According to the Nation, the fire has started around 4a.m. Sunday morning. Reportedly, some female students jumped down from the second floor out of panic. Luckily, no life was lost before the fire was put off. The extent of the damage caused is still unknown as no official statement has been issued by the school authorities.